Mexican food with a bold new attitude, by Linda Matthie-Jacobs and Sheri Morrish, beautifully photo illustrated by Richard Warren. 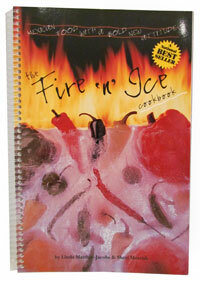 The title refers to the fire of peppers and the ice of cool beverages, the twin themes of this 143 page best seller. Features a terrific selection of traditional and contemporary recipes in a wide range of menu categories. Note: This book is NOT spiral bound as pictured.